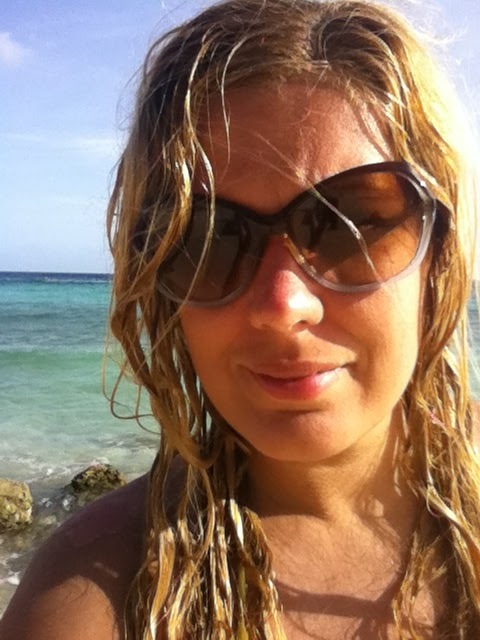 So i just returned from a wonderful vacation in gorgeous Curacao! One afternoon, we decided to take a ride to downtown Willemstad - a picturesque little waterfront town decked out in rows of pretty little pastel colored buildings. This feast for the eyes is also the mecca for shopping in Curacao where you'll fine high end brands as well as souvenir shops to please any one's shopping itch! I was so excited to run into the Inglot store! I first heard about Inglot from my sister who told me that their style concept is similar to that of MAC's but less expensive. I'd never made it out to the store in Jersey so i was anxious to feast my eyes on all the make-up goodness that i was about to encounter! The store was tiny, yet filled with every color of the rainbow! I first glanced at the nail polish selection where i picked up two colors. One was a teal (988) and the other a deep shimmery burgundy (342). I then made my way over to the lip glosses. There were hundreds to choose from. Personally, i need lip gloss like i need a fork in my eye BUT my theory is, can one ever have enough? That's debatable... i for one think not! 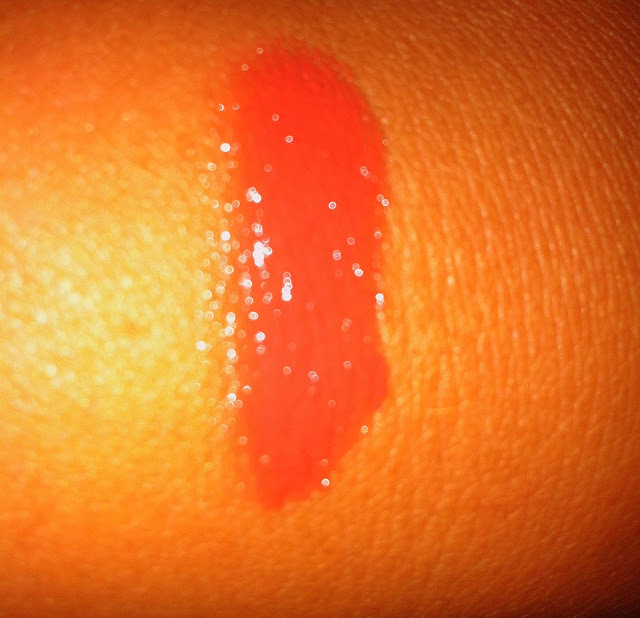 So i snatched up a 'Lip paint' pot in a pretty corally pink color (61) and imagined how pretty it would look paired with a dab of shimmery gold eyeshadow and plenty of mascara! Lastly, the eye shadows... oh the eye shadows... all dreamy pretty colors! 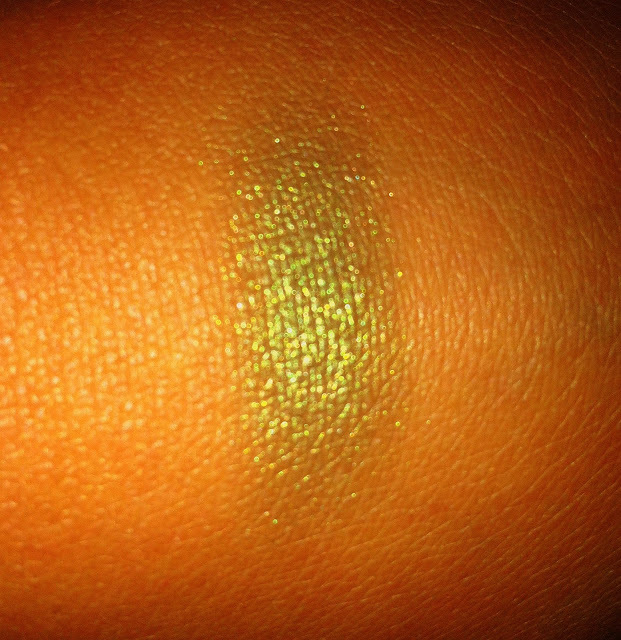 This one in particular caught my eye (44) which reminded me so much of MAC's 'sumptious olive' (one of my favorite shadows)! Since i was running low, i decided to pick that up as well. Overall, i loved the store and their price point was relatively good considering i picked all of this up for about $50. Now the only bummer is the number system versus color names. I personally love, LOVE reading the super creative names of colors whether it be nail polish or blush! I find that it adds personality to the product. A number is so blah! So my one word of advice for Inglot is to convert, convert, convert! Gosh I'd love the job of creating names for make-up colors! Can you just imagine??? Now if only there was a nail polish in "Carla"... i mean hello?? Now that would be a fabulous color, no? Hmmm i better work on that! For now, I'll leave you with these pictures filled with make-up eye candy! Enjoy! Here are swatches of all the goodies i purchased along with a few pictures from this amazing vacation! I'm glad you had a great time! All of the makeup looks amazing! I've never seen so many nail polishes before! This must be what heavens like! Hehehehe! I seriously feel like a good looking into a candy store at these photos! Making a note of this place for the next time I head over to the States. MUST check it out! Loving that deep green! What a great trip! You came home with some great stuff! Thank you for following my blog, I am now a follower of yours as well! Yes - I have 2 shelties, Lady & Shelby. They are our "doggy daughters" and very spoiled! So fun to meet another Sheltie mommy too! Thank you for your sweet comment! I would like to follow each other! I'll start on gfc and wait for you :) This store looks amazing! Hey! Thank you for your sweet comment :) I love Inglot and I LOVE nail polish!!! hello dear! love your blog and love inglot! would you like to follow each other? we follow you now! we just starting with the blog! i accept your suggestion!u have a good blog! thanks for the comment! ofcours we can follow each other!! :) I just follow you! That is make-up heaven!! I love your ring by the way. SO pretty. 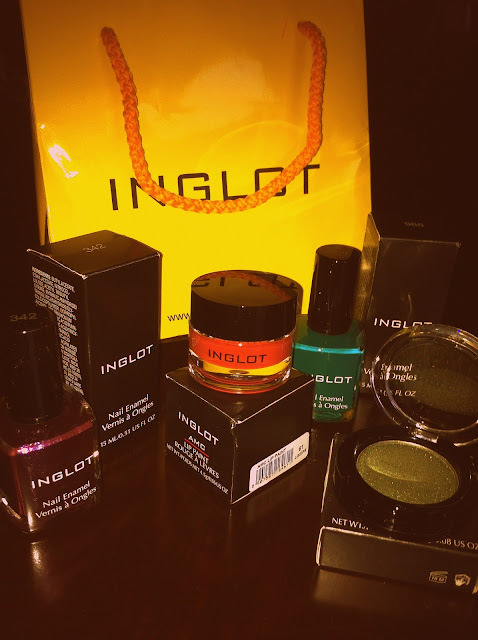 love inglot! I am your newest follower! I cannot wait to read more of your posts and hope that maybe you can return the favor and follow my preppy blog. I always comment for every comment left on my page and hope to start a friendly relationship with your wonderful blog! I also just added a Southern Tide giveaway! Like the shoots and the green nailpolish is amazing! Love your blog!! I follow you now with google friend connect and bloglovin!! Hope you'll do the same! :) I wait for you in my blog! Kisses! Love the make up!The colors are fantastic!Love the nail polish, they are gorgeous! Thanks so much for the lovely comment on my blog, following you dear! Love your blog and thank you for your sweet comment! Following you! Oh exciting, love inglot.. I have a new outfit post up, would love to know what you think!